August is a month of major changes for us. Tiger girl is moving on to a new chapter in her life as she enters school. I’ve decided to send her to the same school as Doggie boy is currently in so that he will be around to guide her for a few months before he leaves and enters elementary school come Jan 2013. It seems like it was only yesterday that I was sending Monkey boy to playgroup lessons. In a blink of an eye he is already in Grade 2 and it’s his little sister who just entered playgroup. 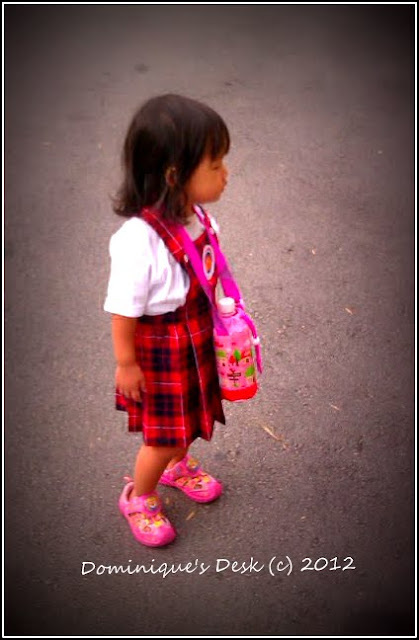 Tiger girl had and enjoyable 1st day of school. She joined Doggie boy’s class and took part in the cookery lesson and water play session which they had that day. The teacher reported that she didn’t cry even though she did asked for me a couple of times. She could understand and follow the teacher’s instructions and interacted with her brother’s classmates. The only thing was that she was reluctant to stay with her own classmates and left her class to join Doggie boy on her own even though the teacher brought her to her class. When I fetched her from school she was all smiles and ran over and hugged me. My little girl is growing up so fast. I’m glad that she had an enjoyable 1st day of school. How was your child/children’s first day of school? Tiger girl looks so cute at her uniform. For sure she will enjoy her schooling time. Both my kids did rather well-My daughter started pre-K the just days after my son was born,I know I was only really worries I wouldn’t get to see her get on the bus. -I was a little more worried about my son-but just like with your kids-My daughter was still in the same building for Kindergarten, they rode the bus together and he did wonderful. My daughters first day of school was fun and easy for her. More traumatic on my end and I felt happy and sad all at once, letting go of control When she started 1st grade, we both were at ease. I’m glad she had a first day at school! I know it’s tough sometimes on both the parent and the child on the first day. Our school starts in 3 weeks and I’m always at the door of the school to greet those students having a tough time. Glad she liked it! Good that her first day went smoothly. It was similar for my son–some small anxiety to be in a new place with strangers, but much more difficult for me than him! My younger boy also preferred his elder brother’s classmate instead of his own. He cried for a few months before he settled down and stopped crying. Oh she is so precious!! This is such a great time for her and maybe a little bit of anxiety for you but she will be great. You have prepared her for this. Good luck to both of you!